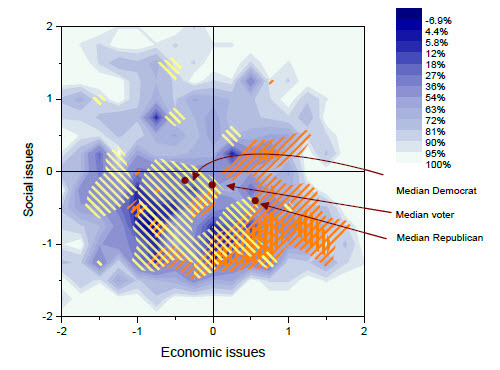 This contour plot shows US voters in 1995 arranged on a two-dimensional policy space. The two dimensions, reported here as z-scores, were derived from factor analysis of approximately 10 items taken from a nationally representative survey. The y-axis captures social issues such as attitudes to abortion; higher values are more liberal. The x-axis is a measure of economic values, such as views on the government's role in the economy; higher values are more conservative. The lightest shaded contour represents an area where 90% of US voters located themselves ideologically in 1995. In addition, areas of the policy space with concentrations of Republicans are denoted by horizontal hatching and areas where Democrats are concentrated are shown with vertical hatching. Finally, the median Democrat, Republican and voter are indicated. Survey data analysed with a third party software. Factor scores for sample recoded into +/- 25 bands and two banded factors input into a crosstabulation to get the observations per cell of the matrix. This was cut and paste into Origin, converted to a matrix, and plotted. The process was repeated twice more, focusing firstly on those who identified themselves as Republican, then Democrat. The second and third matrices, as well as the median points, were added to the initial contour plot. Christopher Claassen is a PhD student in the Political Science department at Washington University in St. Louis, MO.